Manufacturer & Supplier of Stainless Steel 904L Pipe Flanges, SS 904L Slip on Flanges, Steel UNS N08904 Lap Joint Flanges, Stainless 904L Blind Flanges Exporter in India. We, Neon Alloys bring forth an extensive range of SS 904L Flanges, which is manufactured under the supervision of our skilled professionals using latest machinery. We produce SS 904L Flanges such as slip-on flanges, blind flanges, forged flanges, SORF flanges, weld neck flanges etc. in all types of high performance metals & its alloys. 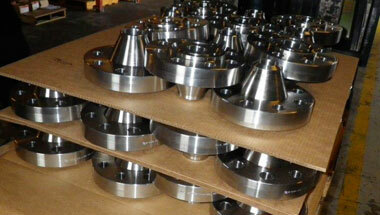 We are one of the most venerable manufacturer and exporters of a broad array of Stainless Steel 904L Flanges. These products are fabricated using quality assured raw material, after doing stringent market research. We do complete quality and performance measures of these Stainless Steel 904L Flanges at various levels of production as to ensuring excellent performance, corrosion resistance, excellent mechanical and electrical properties and durability. As per the varying demands of our clients, we are offering these products in different sizes in order to fit standard pipe. Stainless Steel 904L Flanges Manufacturer, SS 904L Plate Flanges, Steel WNR 1.4539 DIN/ASME Pipe Flanges, SS UNS N08904 Socket weld Flanges Suppliers in India. Peru, Saudi Arabia, New Zealand, Uganda, Cameroon, Sri Lanka, UAE, Colombia, Azerbaijan, Nigeria, Venezuela, Vietnam, Trinidad and Tobago, Indonesia, Jordan, Egypt, Houston, Malaysia, Iran, Mozambique, Russia, United States, Ghana, Israel, Algeria, Kazakhstan, Italy, Africa, London, Angola, Brazil, Thailand (Bangkok), Iraq, Australia, Dubai, Mexico, Kuwait, Chine, UK, South Africa, Germany, Ethiopa, Sudan, Bahrain, Democratic Republic of the Congo, Tunisia, Argentina, Turkey, Morocco, Canada. Kampala, Omdurman, Giza, Byblos, Kolwezi, Alexandria, Hong Kong, Mbuji-Mayi, Lubumbashi, Data from the UN, Singapore, Aqaba, Ouagadougou, Beirut, Yaoundé, Khartoum, Cape Town, Accra, Dar es Salaam, Port Harcourt, Kaduna, Lusaka, Manama, Tel Aviv, Antananarivo, Rabat, Lagos, Bulawayo, Benin, Kinshasa, Subra al-Haymah, Brazzaville, Algiers, Soweto, Casablanca, Riyadh, Abidjan, Port Elizabeth, Mecca, New York, Jerusalem, Kano, Dammam, Cairo, Freetown, Bethlehem, Johannesburg, Zaria, Ibadan, Pretoria, Douala, Dakar, Durban, Addis Ababa, Istanbul, Maputo, Maiduguri, Muscat, Doha, Nairobi, Mogadishu, Fez, Dubai, Luanda, Colombo, Jeddah, Cairo, Sharm el-Sheikh, Harare, Tripoli, Tehran, Amman, Conakry, Abu Dhabi, Bamako.